I channeled my inner Cyndi Lauper put together a little somethin' to look "retro" for my final run for 2012. 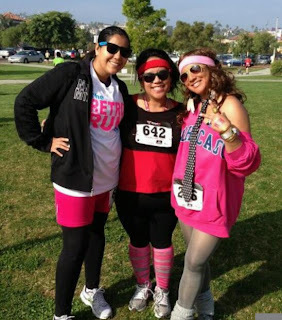 I ran/walked with my partner the entire year, Eleina, and we bumped into my cousin Rowena who ran retro also! Christmas is my husband's favorite season and thus has become a big deal in the Garcia house! This year my boys started attending Sunday School and learned about "Jesus' Birthday" and the meaning of the Christmas season. 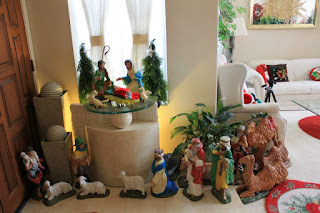 It was delight to hear my sons repeat the stories they learned in Sunday School and all the more amazing that every time they see the Nativity Scene, they can tell the story, through a 4-year old's point of view of course! Every year we visit local Christmas light displays around San Diego. Our favorites are Christmas Card Lane in Rancho Penasquitos, Candy Cane Lane in Poway, and Belardo Lights in Tierrasanta! My husband's company, Quickplay, and a great holiday party at the US Grant Hotel in Downtown San Diego. The hotel lobby was beautiful. the food was delicious, and the quality time with the hubby was the best! Ferrero Rocher Chocolates are too good to keep yourself! And that makes it perfect for golden gifting moments. 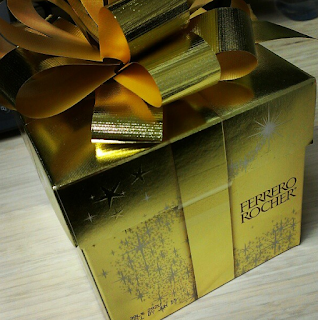 I always see Ferrero Rocher in the stores all year long, but I save the indulgence of its yumminess for the holidays! Thanks to Influenster, I was able to share these golden yummies with some special friends, Godfather to our son, when they invited us over for a holiday "jump party"! Usually, jumpies are in the back or front yard right? Well, my boys jaws dropped when they walked into their Godfather's house to find the jumpy was in the living room! The looks on my boys' faces and the fun they had having the jumpy all to themselves was priceless! Their Godfather knows them all too well! Golden gifts not only come in golden packages, like the yummy Ferrero Rocher, but also golden, priceless moments like the gift of some jumpy fun! Keeping two kids under the age of 5 busy and entertained is always a dilemma. My boys love "going out" as they call it. They hate staying home. I guess they've been spoiled by living in "America's Finest City" San Diego. There is always something fun to do and the weather is most always perfect! Yet, on the days budget is tight or I'm just too tired to take two little boys out on the town, I try to find some fun activities at home to engage them. Of course,I want them to have fun and try new things, but learn something as well. 1) We've painted bird houses I bought at the dollar store and then did a little nature walk in our backyard to find the perfect place to hang them! 2) Using foam stickers and some construction paper, we made our own counting books! 3) Using old magazines and construction paper, my I had my kids cut out and paste pictures that matched the color of the paper. Being an educator is the most rewarding job in the world! I treat my students like they are my own. I want the best for my students just as I wish the same for my own children. I realize and value the great trust parents put into their schools and teachers in caring for their children. The sad event of Sandy Hook Elementary School in Newtown, CT., breaks my heart. I feel for those heroic teachers who protected their students and, for some, gave their lives for the students they serve everyday. School personnel never think they'll ever have to risk their lives like soldiers, police, or firefighters do on a daily basis. Yet, when duty calls, teachers are just as brave and committed to the service to their students and their families. Il Volo's "We Are Love"
Oh swoon! The three handsome Italian pop-opera singers from Il Voloare to die for! The teenage tenors, Piero Barone, Ignazio Boschetto, and Gianluca Ginoble, have voices to rival men triple their age! Thanks to Passionate Digital I was able to listen to their newly released album We Are Love. 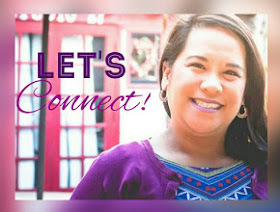 Want a Piece of ModDiva?